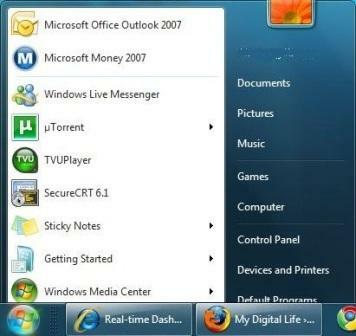 The Start Menu of Windows 7 may occasionally “fall into” or drop and shrink below and behind the Windows Taskbar. The abnormal behavior of Windows 7 Start Menu causes bottom part of the Start Menu especially Start Search and Shut Down options invisible. Luckily, the problem hardly happen even occasionally, but if it does occur, here’s a trick to quickly and immediately fix and resolve the error. The problem appears to be the ‘Start Menu window’ been moved to another location, mysteriously and for unknown reason. In order to fix and restore Start Menu to its original default and “by right” position, unlock the Taskbar (by unticking Lock the taskbar option when right clicking on empty space of Taskbar), and then move the Taskbar to another position on desktop (can be to the left, right or top position), before drag it back to original bottom of the screen position. Once Windows Taskbar is back to position, Start Menu will be recovered and reverted to its default location, i.e. above the Taskbar. If the trick above doesn’t solve the Start Menu issue, try to change any customization option of Start Menu (right click on Start Menu button and choose Properties, and then click on Customize button). Apply the change. Then, revert the change back to original settings. The Start Menu should be fixed this way too.